Senior Ariel Nickell rises for the jumper over CCU defenders. Junior guard Carla Booth swished in 22 points and orchestrated an early three-point barrage by the hosts, as the Alice Lloyd Lady Eagles overwhelmed conference foe Cincinnati Christian University, 104-86. The game was the first played in 2014. Alice Lloyd must have made a New Year’s resolution to wear out the scoreboard as they vaulted out from the start behind the strength of their perimeter shooting. The Lady Eagles sank six bombs in the first eight minutes, three of them courtesy of sharpshooting freshman Amber Shepherd, and quickly roared to a double-figure lead. This lead soared to as many as eighteen (32-14) following a jumper from senior Ariel Nickell at the 9:00 mark. The hosts cooled off somewhat after that and settled for a 48-36 lead at intermission. Any hopes of a Cincinnati comeback were quickly dashed as Alice Lloyd wasted no time in increasing their lead to twenty points. The score stood at 68-46 with 10:00 remaining. The guests battled hard, but were unable to reduce the deficit by very much as the Lady Eagles coasted to the win behind the strength of 15 made three-point baskets. For the victors (7-5; 2-1 KIAC) Booth led four players in double figures with her 22 points. She also collected a whopping 11 assists. Shepherd added 21 points, while Nickell rammed in 19. Senior Courtney Crowder contributed 12. 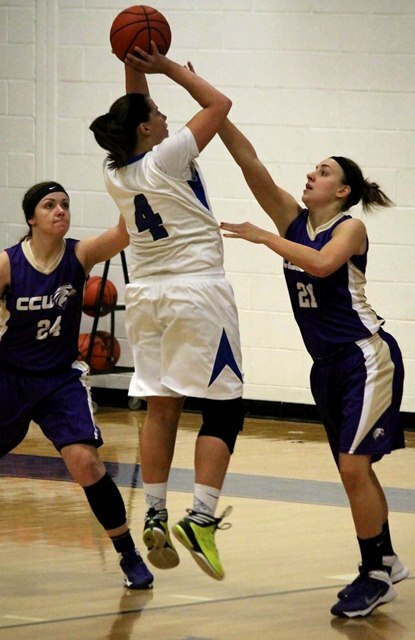 For CCU (4-9; 1-3 KIAC) Amanda Baute led all scorers with 31 points. The Lady Eagles return to conference action on Friday, January 10th, for a home match-up with Carlow University. The game is set to tip at 7:30 PM.